Comet Trio, the classic family dinghy.. When we say the Trio is an all rounder we really mean it. 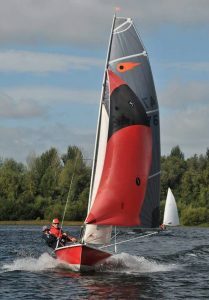 Designed by Phil Morrison, with classic hull lines the Trio is thoroughly modern, but retains some well-proven features of older dinghies. At 15′ the Trio has the length to give effortless performance, the ability to carry a large family, and to be quite steady and reassuring when the weather turns nasty! “Sit in” seats and a deep cockpit floor, combined with a relatively high boom make the Trio a superbly comfortable dinghy to sail. Note: The Mark 2 Trio is now being manufactured by Peak Dinghy. Glyn Rawson is producing hulls which now have a more flexible Selden mast and boom with all halyards internal. A new main available in laminate or in dacron as well as a better shaped geniker radially cut and better shaped. Geniker chutes are now fitted as standard replacing the bag system. Mark 1’s and 2’s are being raced together at the Nationals and Inland Championships snd separate prizes are awarded for both fleets.